For viewing labels on two adjacent panels of a box or pallet, FOX IV can equip our printer applicators or label applicators with specialized application equipment. For two separate labels being applied to adjacent panels, our Repeater™ rotary actuator is employed. 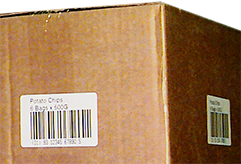 This method of label application prints and applies a label to the leading panel of the container. After the first label is printed and applied, the applicator returns to the home position where a second label is printed and then applied to either the top or side of the container. This method is often chosen as an economical way to label adjacent sides of a container. Because two separate labels are used, the over label cost is less than utilizing a wrap-around label. Specifically, you are not paying for the portion of the label that is used on the corner of the container where there isn’t any text, graphics or bar codes. For those applications that require corner wrap two panel labeling, FOX IV has two different label application methods…the Sidewinder™ and our Split-Tamp application method. With the Sidewinder™, the wrap around label is applied to the leading or trailing panel of the shipping container. A secondary mechanism then brushes or rolls the label around the corner to secure it to the box or pallet. The Split-Tamp method uses a unique dual-cylinder application arm to place the label on the leading panel and then wipe it around the corner as part of its operation. Utilizing this method, FOX IV has been able to apply a very large 8.5″ x 17″ wrap around label to a pallet. 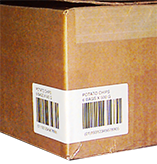 Any of these methods can be used for two panel labeling onto boxes, totes or pallets.